The CS features a BAKFlip F1 or HD cover with a Contractor Series Rack System. 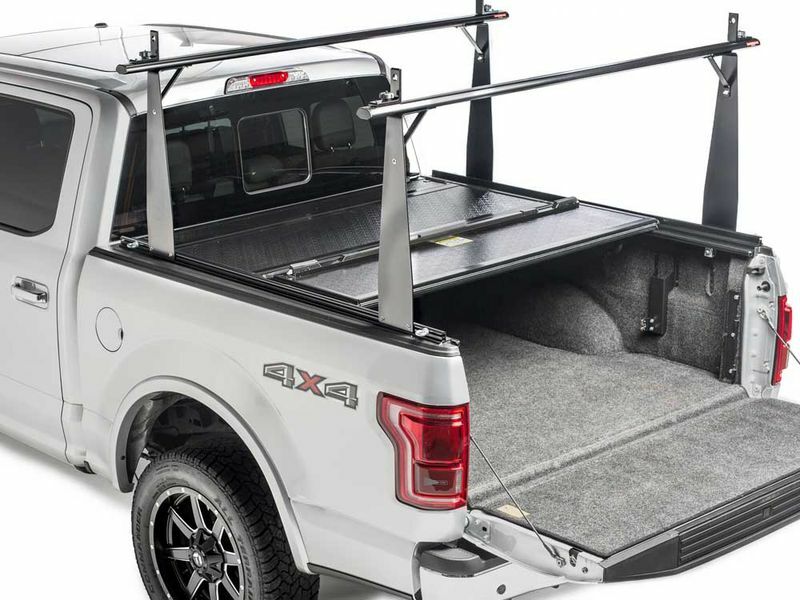 Enjoy all the features of a tonneau, with the revolutionary BAKRak System. Use the rails to slide the rack to the front or back of the bed for maximum utility. The CS features two types of tonneau covers, the F1 and the G2. The F1 has a FRP construction that is powder coated, and can hold up to 400lbs evenly distributed. While the G2 has an aluminum construction that is powder coated and can hold up to 300lbs. Need to haul large items? No problem. Fold the cover up to the cab for full_bed access. Rubber bumpers protect the cab from impacts. To accommodate cargo of all shapes and sizes, Sliding Locks and Tie Downs are optional. Other optional accessories include Bike, Ski, and Kayak carriers. Because of the No_Drill Clamps, the CS can be installed in less than an hour without drilling into the truck bed. A tailgate key is the only way to get into the truck bed with a CS installed.